Copritestata Marshall originale. Usata molto poco in combinazione con cassa Marshall da 4 coni. Vendo solo testata. Made in UK JCM800 Series Model 5503 Combo 1x12" 30 watt RSM 4ohm Solid state Black tolex. In the heart, in the head, in the air. In what you think. In dotazione anche pedale switch originale Marshall. Marshall JCM 800 2205. Amp ist von 1988, kein "channel bleeding", wie bei den früheren Modellen, da die Schaltung. von Marshall ab 86/87 leicht geändert wurde, um dieses Problem zu beseitigen. Wegen Sammlungsverkleinerung zu verkaufen. E-Gitarren Vollröhren Topteil. - 3x ECC-83 Vorstufenröhren. - 4x EL-34 Endröhren. - Gewicht nur 18,8 kg. - Nach den CE Richtlinien der EU geprüftes Gerät. - 3-Band Klangregelung mit Presence. 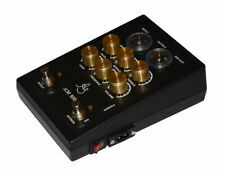 - Einkanaldesign mit High- und Low Sensitivity Inputs. Marshallsound pur: Das Modell 2203 gilt als der JCM800 Amp! Pure Marshall Sound: Model 2203 is considered the JCM800 amp! nach den CE Richtlinien der EU geprüftes Gerät. Einkanaldesign mit High- und Low Sensitivity Inputs. Marshall jcm800-e-chitarre pieno TUBI Topteil - "showroom MODEL"
E-Gitarren Vollröhren Topteil. Marshall JCM800. - 3x ECC-83 Vorstufenröhren. - 4x EL-34 Endröhren. - Nach den CE Richtlinien der EU geprüftes Gerät. - 3-Band Klangregelung mit Presence. Marshall® Lüftungsgitter aus Plastik für JCM800, JCM900 wie abgebildet. El estado es Usado. It is an ideal ampli to put him little bugs and play with him. Marshall JCM800 - E-Gitarren Vollröhren Topteil - "Showroom Model"
**FOR SALE** Marshall JCM800 Super Bass Mk ll 100 Watt head. In well used condition, we have just had it serviced by Bill Armstrong, so it is all good to go. These classic Marshall's are very saught after for their fantastic clean tone & this one is no exception, sounds fantastic. This board can be used to upgrade a reissue amp or to build a new amplifier. The wiring, soldering & layout are clean and professional. Top notch components were used all the way around. JCM800 2204/2203 50W &100W Turret Board, Sozo, Mallory, Alan Bradley. Nonetheless, the playing had seriously evolved and the players demanded a more articulate amp that could keep up with their complex rhythms and over-the-top soloing. The ArthurSounds JayCee8 is a faithful reproduction of that British amplifier. Marshall JCM 800 Lead Series 300 Watt 1960A 16 Ohm Cabinet. Pictures show condition which is excellent. In 1981, Marshall launched the JCM800 series. The 2203 and 2204 had been in production since 1975, they were redesigned and introduced as JCM800 amplifiers in '81. Up for sale a1989 Marshall JCM800 - 2203 Lead Series 100-Watt All-Tube Guitar Amplifier Head - #X09209! Marshall JCM800 2203x 100 watt Guitar Amp. Condition is Used. Amp has a couple tolex dings, but other than that it’s in really nice shape. Had new JJ’s high gain set from Eurotubes installed the first of April. This is an empty guitar cabinet to be wired with the user's preferred specs. Includes lead wires for hooking up speakers. Tone House Studios has new Guitar and Recording Studio gear being added every week! Your chassis must be 27" wide x 2-1/2 " tall x 6-3/4" deep. Front chassis cutout is 26" x 2-3/8". only buy if you are serious and know what your looking at. I will be more then glad to assist you in any way I can. Originally introduced in the 80’s, the JCM800 2203 established itself by uniting iconic Marshall design with that genre defining heavy rock crunch. AUTHENTIC JCM800 2203 TONE. UK MADE ALL VALVE AMPLIFIER. This is the 1986 (U serial) Marshall JCM800 50w Tube Amplifier Head. This JCM has been more than fully tested and works as it should. Every Marshall head has a different personality. With a Chinese 12ax7 in V1, the gain on this amp is just unparalleled- perfect Marshall snarl. Marshall JCM 800 2203KK Kerry King Signature. Here is a very clean and Kerry King Marshall Head. Limited production. The Marshall JCM 800 2203KK Kerry King Signature features a custom designed tribal front. Power Consumption: 20W or 5W. Speakers: 1x 10in Celestion V-type (combo only). Equalisation: Treble, middle, bass and presence. Channels: Single channel with four separate inputs. Valves: 2x ECC83, 1x ECC83 (phase splitter) and 2x EL34. British Custom 7 Head Carl's Custom Amps! 7W JCM 800 Plexi! Video Demo! If you have ever played a 50 or 100W hot rodded JCM 800 you know what a great, cutting and aggressive sound you can get but you also know that it's really too loud for most situations. GN'R, Van Halen, Aerosmith, AC/DC types soundx are all there and with the gain lower you can great great blues tones. The amplifier is in great visual and technical condition. Only 600 pieces on worldwide it is very rare. Tubes and all parts are completly working. Case is included. This is 1995 Marshall JCM800 2203 LE. We also have red Marshall 1960A Cabinet. Fuse : T2A was replaced with T1A. The amplifier has preamp like as JCM800 2204 Lead serie. 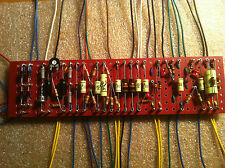 Preamp 3x6N2P = 12AX7 tybes. Output to speaker 8-16 Ohm. All tubes can be replaced without soldering.The switch is installed on the back panel. 1989 Marshall 2 channel 1x12 50 watt combo with reverb. Good condition. Amazing sounding amp! You see these more often in red, but to find one in orange is crazy. It truly is a special amplifier. It has been kept as a 'piece of furniture' in a clean house for many many years. There has been a hole drilled for another valve base which was unused (drilled at the factory). Marshall JCM 800 2203 100W Reissue 2011. The apmlifier is in great condition. Everything is 100% working. For info, advice and the Best Prices -. 4 x EL34 Power Amp Valves. Series FX Loop. 3 x ECC83 Pre-Amp Valves. 100 Watt Output. GAK Saving: % OFF. £ 1,429.00. RRP £ 0.00. Speaker mounting hardware is included. Custom30" wide x 20" tall x 10-1/2" deep pine wide panel suspended baffle design empty rear mount 2x12 combo cabinet with side handle openings . Your chassis will mount to the upper rear panel. Amp Type: Push-Pull. Mounting Center Distance B 3 in. Mounting Center Distance A 3.2 in. Item Height 4.6 in. Item Width 4.02 in. Item Length 3.75 in. MARSHALL OUTPUT TRANSFORMER 50 W TUBE AMPLIFIER JMP PLEXI JCM800 BRAND NEW !!! Gives great classic sound. Mounting Center Distance B 3.16 in. Mounting Center Distance A 3.22 in.